Use this standard leash extension to extend any leash. If you are looking for an extension with a little bungee resistance check out our bungee leash extensions. Add extensions to any leash. 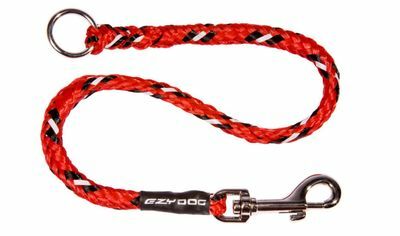 Easy extension for the WalkyDog bike leash or the Cujo bungee leash. Currently available in 24 inches. Dual Tangle-Free Dog Walking! Add 2 extensions to a leash and the 3 swivel points allow for 2 dogs to walk without getting tangled. Slip the clip through the ring for use as a Choke Collar for training or for times when a collar isn't available.